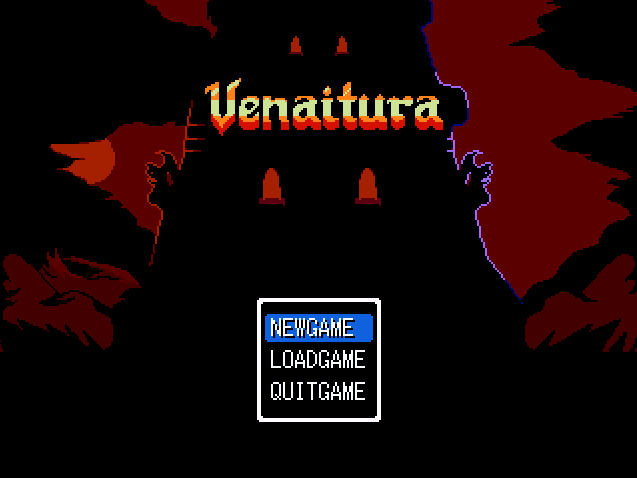 Add a screenshot to the game Venaitura. Lord Zadigan has summoned the dread Tower of Venaitura from the depths of the Dark World of Radunga and is using it to spread his evil influence across the the land. He has dispatched his finest combatants, the Six Purveyors of Doom, to retrieve the only six artifacts capable of stopping him. Summon four Champions from the Realm of Heroes and lead them across Tsufana on a journey to thwart the malevolent Lord of Monsterkind. Shall you banish Zadigan and his vile conjurings back to Radunga in a bid to restore peace to the world forevermore? Or will the forces of darkness at long last overthrow the realm of light? In this harrowing tale of Good VS Evil, you'll assemble a party of Four Champions from Nine available Character Classes and lead them on an arduous journey to topple Lord Zadigan's forces. You'll conquer six distinct lands wrought with monsters and other nefarious ne'er-do-wells as you aim to destroy the Six Purveyors of Doom and end the misery brought in their wake. As it has always been, my latest project has taken a page from Dragon Quest/Warrior's book and focuses on the journey more so than the destination. Each continent and island you'll visit while traversing the vast world of Tsufana is complete with its own self-contained tale involving one of Zadigan's Purveyors of Doom and a Heavenly Artifact. 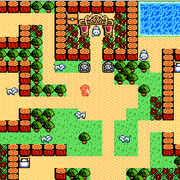 "Venaitura" builds heavily upon what I attempted with both "Dragon Fantasy 2" and "Dragon Fantasy: Heroes of Tsufana". Unlike its predecessors however, you're given free reign over how to assemble your party; the "Hero" class is no longer mandatory! There's also slightly more focus on the story and character interaction/dialogue than my other "retro/classic" projects, but the adventure and exploration will (as always) be at the forefront. Skilled warriors capable of wielding most of the game's available weaponry. They've a fine repertoire of physical-based abilities, with effects ranging from causing severe bleeding to instant death. Combateers also specialize in lowering an opponent's DEF, and eventually learn an incredibly powerful ability that pierces an enemy's defenses altogether. These powerful sorceresses toss elemental spells around like nobody's business. Aside form their incredible innate INT stat, their MP Pool is second only to the experienced Wiseman class. While limited to single-target abilities, these ladies pack a punch that can be matched by no other. 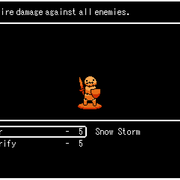 They also have access to a small assortment of basic status ailments, and love lowering the INT of their foes. The Paladins of Tsufana. They're skilled combatants and healers, and pride themselves on their ability to effectively deal extra damage to Demons and the Undead with their Holy-element abilities. They're the only class that has access to the mighty Revive spell, and can potentially learn to raise their allies natural elemental resistances. Masters of debilitating those who scoff at their fascinating dance maneuvers. Status ailments are the Dancer's forte, and they've got them in spades! And best of all? They target the entire enemy party. Confusion, Berserk, Petrification, and Sleep are just a taste of the devastation these skilled combatants can bring to the battlefield. Exceptionally skilled mages who view simply targeting a single individual to be a waste of time and beyond them, thus all their abilities focus on destroying or recuperating entire groups of friends or foes. Despite this potential for mass destruction, they're incredibly fragile. Wisemen boast the greatest MP Pool of all classes, and don't think twice about sharing it with their allies (through their MP Gift ability). Skilled outdoorsmen that specialize in targeting a specific enemy type and dealing critical amounts of damage to said type. Huntsmen can also generate potentially unlimited amounts of Herbs and various other basic items like Eye Drops and Antidotes. Strange but capable creatures that learn mid-tier magics of both the single and multi-targeting variety. Slime Knights can absorb an opponent's HP, and also inflict an incredibly deadly Potent Poison with their venomous feelers. They're also capable of (eventually) lowering an enemy's elemental resistances. Boast an ATK higher than the Combateer, but lack their finesse with the sword or their skill with a variety of other weaponry. Barbarians take delight in destroying an opponent's appendages (be it their arms, legs, or even torso), as well as dishing out extra damage when faced with Mages or other magical enemies. These fierce, blood-thirsty warriors can also cripple an opponent and lower their ATK. Man's best friend! But this is no ordinary canine. This pooch can stun their enemies with some ferocious barking, or increase their friends' ATK with an empowering howl. Overall they're a mixed bag with an incredible variety of abilities capable of healing, debilitating, and even summoning friends to crush their enemies! Last edited by EphiamOricuna on Mon Feb 25, 2019 4:27 pm, edited 1 time in total. A demo is now available for download and is being hosted on RMN! Check out the link provided in the main/opening post. man first person battle systems aren't my cup of tea otherwise I would have definitely downloaded this bad boy. but we don't see many games being made here so keep up the good work! 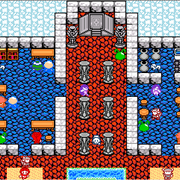 The color palette and the first-person combat remind me of the original Dragon Warrior. I had some fun with that game. Was it 25 years ago? 30? Thanks a lot! 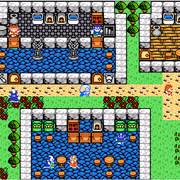 And yes, it definitely takes a hefty dose of inspiration from the oldschool Dragon Warrior and Final Fantasy entires (1-4).